Arizonans fought our way back from tough economic times. 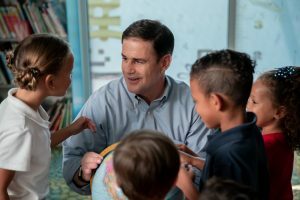 Now, it’s up to us to secure Arizona’s future with safe, well-funded schools. Just a few years ago, families were hurting, and Arizona was $1 billion in the red. Today, Arizona is growing, and we are investing in what matters most — like K-12 education and public safety. Investing in the health, safety, and success of our schools is paramount to the long-term success of our State. That is why Doug has made school safety and school funding his primary focus. Following the tragic shooting in Parkland, Florida, Doug brought together parents, students, teachers, law enforcement officials, prosecutors and mental health experts to draft the Safe Arizona Schools Plan. This common-sense, multifaceted solution puts more cops on campuses across Arizona, increases the number of school counselors, creates a central tip-line for reporting safety concerns and provides further tools to keep those with severe mental health issues from possessing a gun. Further, it improves the background check system while protecting our rights preserved under the Second Amendment. 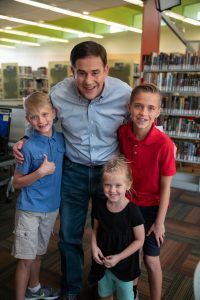 Doug believes a quality K-12 education system is the most important thing we can do to ensure Arizona kids have a strong and secure future. His focus is on increasing our investment in public education and improving results in the classroom. A 20% teacher pay increase by school year 2020. Prop 123, the bi-partisan effort that injected $3.5 billion over 10 years into Arizona’s K-12 schools. Restoring recession-era cuts to school funding — $371 million over the next five years — that can be used for support staff, textbooks, technology, and other school improvements. The Arizona Teachers Academy, created to attract new teachers by allowing aspiring teachers the ability to finish college debt-free if they commit to teach in an Arizona school. Being the first state to pass the American Civics Act – a new law requiring all high school students to pass the same civics test any new naturalized citizen has to pass in order to graduate. Doug wants to see more dollars go to the classroom, and continue to drive up teacher pay, while investing in other key priorities like career and technical education and high-speed broadband in our rural and tribal schools.